It's nice to start with a picture, so here is a "before" picture of when I organized Ivo's books. I like to motivate myself with before and after pictures, it's very satisfying to me. Strange but true. This was a big job, and the picture only shows a portion of the mess. Our library sells children's books 12 for a dollar, so it can be so hard to resist. but yikes. 1. Hardcover or paperback, and why? I like a paperback book with a really good binding. 2. If I were to own a book shop I would call it… I liked Stacey's "Rainy Day Books" with big chairs and tea. Doesn't that sound so cozy? But not to be a copycat, I would have a children's book store and call it something cute like "Firefly Books". I think fireflies bring up a lot of happy memories for many people. We would have books for children and books about parenting, uplifting things about creating a harmonious and nurturing family life. And there would be big fluffy chairs and coffee and baked goods and things. This is my fantasy so I don't have to worry about little kids smearing pumpkin bars on the merchandise. 3. My favorite quote from a book (mention the title) is… "Believe me, my young friend, there is nothing--absolutely nothing--half so much worth doing as simply messing about in boats." from The Wind in the Willows. I can't come up with n all-time very favorite off the top of my head, but that's a pretty good one. 4. The author (alive or deceased) I would love to have lunch with would be …. Fred Rogers, I think he counts as an author. Maybe an odd choice to those of you who are big readers, but I really can't think of anyone else I'd rather meet. 5. If I was going to a deserted island and could only bring one book, except from the SAS survival guide, it would be ... The Complete Stories of Erskine Caldwell, then I could read a new story every day for 96 days. Or maybe I'd pick Be Here Now, so I could blow my mind and return from the island as a yogi or something. 6. I would love someone to invent a bookish gadget that…. I have to say I agree with Stacey on the hands-free book holder and page-turner. For lying in bed reading and eating ice cream, of course. 7. 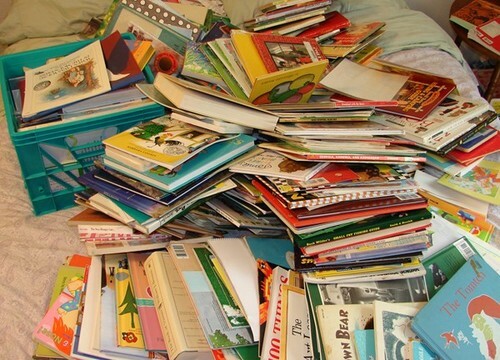 The smell of an old book reminds me of….going to the flea market with my mom and my sister when I was a little girl. 8. If I could be the lead character in a book (mention the title), it would be…. Any member of The Little Fur Family, warm as toast, smaller than most, in little fur coats, and they lived in a warm wooden tree. 10. I hate it when a book…. splits down the middle from a cheap binding. Thanks, Stacey. Sitting around daydreaming about books was much nicer than what I should have been doing (cleaning the kitchen and picking up toys). Ok, now I'm going to tag Jenny from Wildwood Cottage. Your answers bring back memories.......I especially liked your quote from The Wind In the Willows. With your family background, it's more than appropriate! I was also glad that you didn't pick Marchpane (she was so very mean) or Birdie Plantagenet for the answer to number 8----poor Birdie....we always used to cry at that part! I love that Ivo has access to so many books. I am bringing him a special old one when I come to visit! I love the wind and the willows quote, it may have to make its way into our trip journal. Be Here Now - Great choice! I love the deliciousness of all those scattered books! :) Happy reading! I just love your fantasy book store. I want to go there on a rainy day and hang out.